Last week I stopped by Nacho's downtown on Jefferson to check it out, and while it was straight-up noon, there was plenty of metered parking nearby. The place, which serves breakfast and lunch weekdays, is small but not teeny-tiny. There are 20 or so tables, from two-tops on up. It was about a third full on my visit, and on that day, front of the house was a one-man operation, with literally one man taking orders and acting as waiter and cashier. Given the situation, the mood might have been hectic, but it was quite upbeat. 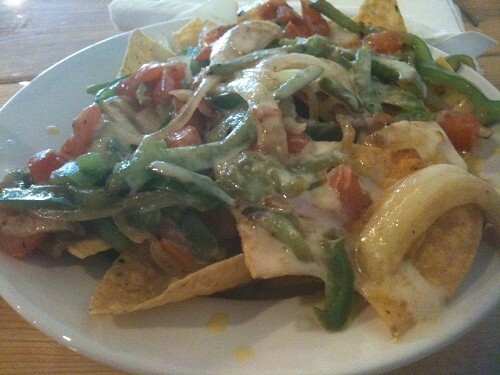 There are, in fact, nachos at Nacho's. I ordered the Grilled Nachos ($9.99). 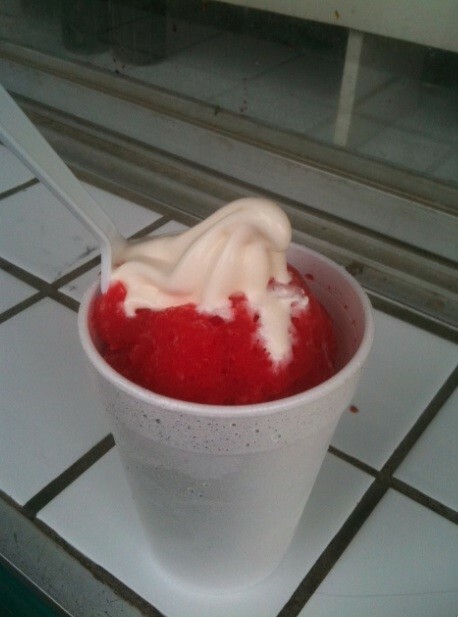 This usually comes with a choice of steak, chicken, a mix of chicken or steak, or shrimp. I stuck with just the veggies— grilled onions, peppers, and mushrooms— topped in a very good mild cheese dip. I think the addition of a heap of well-seasoned black beans would put this dish over the top. Other nacho options include Nacho Average Nachos (with pulled pork, chicken, and steak) and Sweet & Sour Nachos (chicken, onion, bell pepper, pineapple, with sweet & sour sauce). The menu also features a fine selection of sandwiches and wraps — the intriguing Ninja sandwich (with turkey, roast beef, swiss with Teriyaki sauce and sprouts, among the ingredients) and the Fireball of Freedom wrap (turkey, roast beef, bacon, plus more topped with a habanero sauce. Nacho's also serves Bi Bim Bop, which plenty of folks were ordering on the day I was there. On the breakfast menu, there's the Korean Omelet Plate, with fried rice and your choice of beef, chicken, or vegetables. 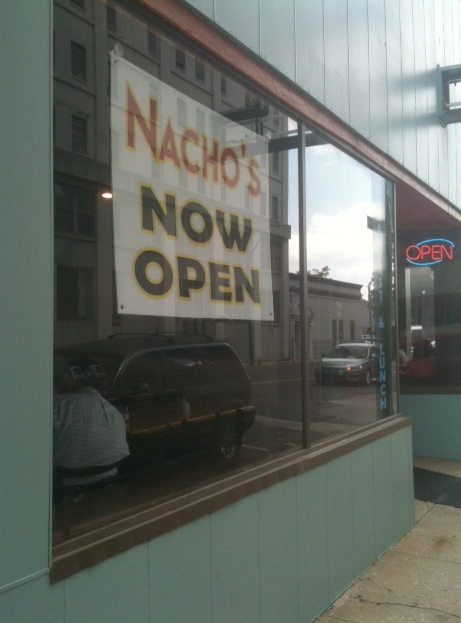 Nacho's is open Monday-Friday, 7 a.m.-5 p.m. Take-out and delivery is available. Cafe Pontotoc, so named because it's near the corner of Pontotoc and S. Main, will open in mid- to late-June, according to owner Milton Lamb. Lamb says the restaurant will feature a great wine list and beer from local brewers. 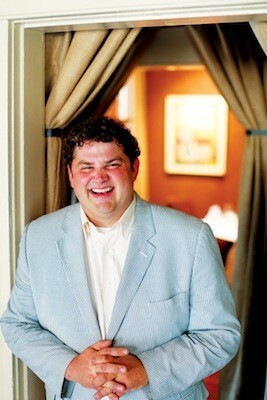 While the menu is still being worked out, Lamb says it will include a selection of small plates. 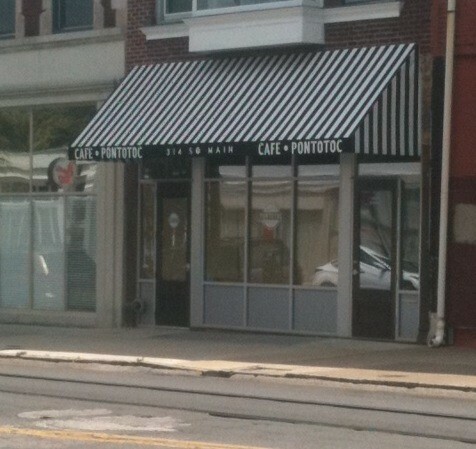 Cafe Pontotoc will be in the old Corked Carrot space at 314 S. Main. Lamb says that the space is much the same, though he's brought in some new tables and redid the back bar. Lamb says the restaurant will initially be open Tuesday to Saturday, starting at 4 p.m., and will eventually expand to 7 days a week. He's also considering having a Sunday brunch. Lamb calls Cafe Pontotoc a "nice neighborhood hangout." It will be a place, he says, "to sit down and have a conversation." Ecco on Overton Park opened a few weeks ago in the old Fresh Slices location in Midtown, and owner Sabine Bachmann says that in that time she's spotted a few repeat customers. It makes sense. I could easily picture this restaurant becoming a regular spot for those in the neighborhood. Indeed, when we stopped by for dinner on Saturday, it appeared that many of the folks knew each other. While the wait staff wear a uniform of plaid shirts and jeans, Ecco is on the nicer side of casual. The walls have been painted a stark white and hung with paintings of bright, primary colors. The booths are gone, and in their place are wooden tables seating two, four, and six. There are a few tables on the small front patio and more seating on a back deck. 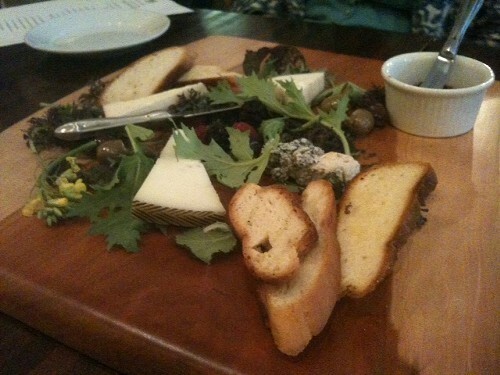 We started with the cheese plate ($15) — imported cheeses with olives and tapenade. It was served on a thick wooden cutting board and the cheeses (a good mix of a strong blue cheese and mild cheeses), olives, and slices of bread adorned with a sprig of flowering broccoli rabe was so artfully arranged that it looked like the subject of a still painting. The first person to correctly ID the dish and where I'm eating wins 4 passes to this week's Memphis In May World Championship Barbecue Cooking Contest. The tickets are good for any day. 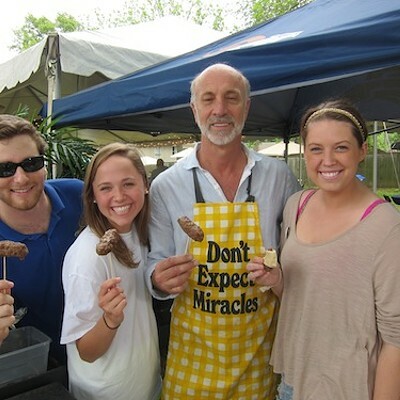 Winner will be notified before Barbecue Fest's opening day on Thursday. 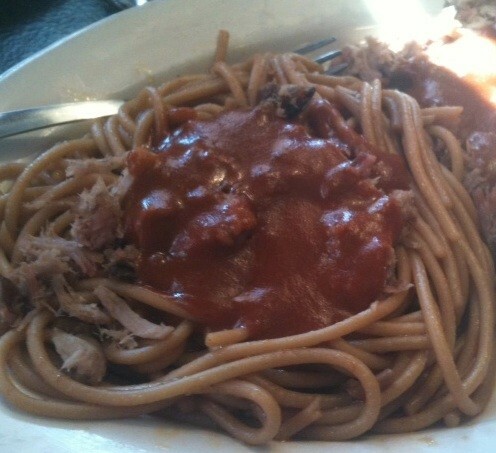 The answer to last week's contest is the barbecue spaghetti at the Bar-B-Q Shop, and the winner is ... John Scruggs! When Odysseus and his crew visited the land of the Lotus-eaters, they encountered a people so completely devoted to their own appetites that they did nothing all day but sit around and feast on the narcotic fruit of the lotus plant. The sailors tried it too, and they almost ended up staying. It was all Odysseus could do to get them back on the boat. Much the same thing happened yesterday, here in Memphis. 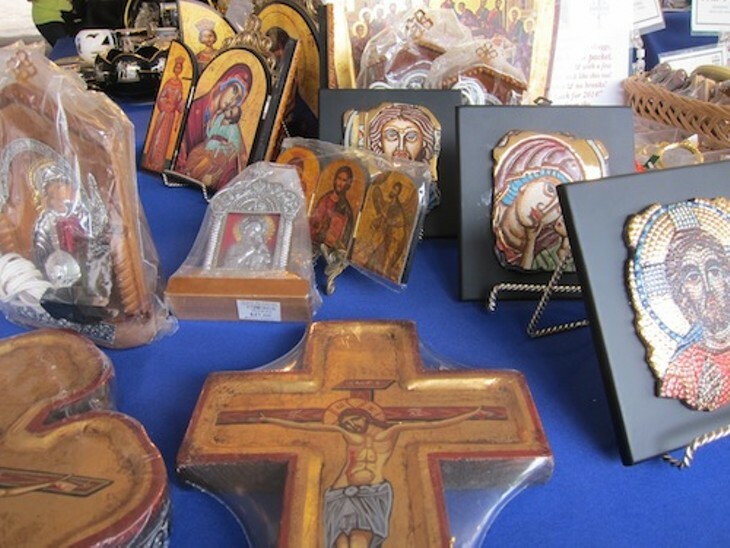 I’m speaking, of course, of the Memphis Greek Festival. 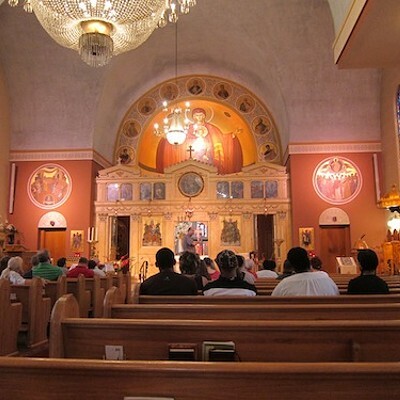 After landing my vessel at Annunciation Greek Orthodox Church and partaking in the feast, I very nearly foreswore my homeland and stayed. No, they weren’t serving lotus fruit. But I think baklava cheesecake will do just as well. 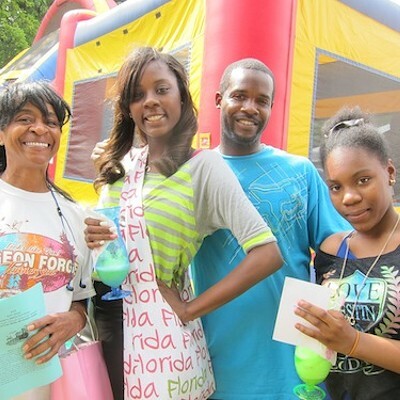 The festival continues today until 8pm. For me, the food is the main draw—about which, more later. 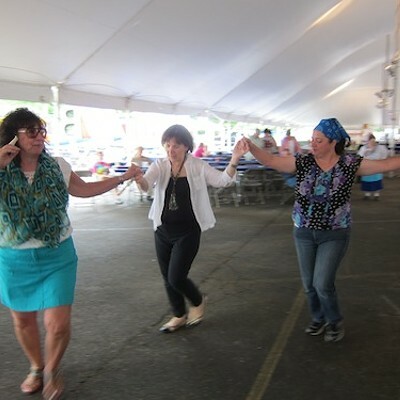 The festival also features live music by Kostas Kastanis and and traditional Greek dancing by the Athenian Dance Troupe. There are bouncy castles and an outdoor marketplace. For those who like a bit of theology with their spanakopita, there are even church tours led by Annunciation’s Father Jim Berends. Back at the festival, I had a late lunch with Anna Denton (nee Maniatakou). At age 79, with wavy gray hair and a mischievous twinkle in her eye, she’s everybody’s Mediterranean grandma. 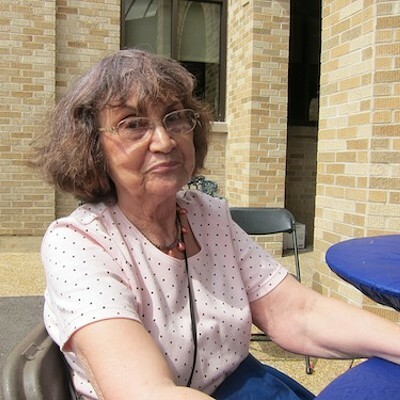 She’s also one of the women who helped start the Greek Festival back in 1958, and she’s been helping out ever since. “I’m the one who started doing shish kebabs,” whispered Denton. 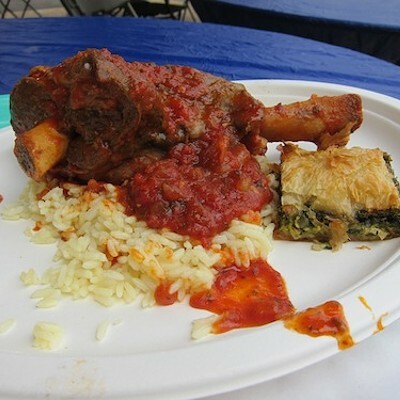 At Denton’s recommendation, I tried the lamb shank with tomato sauce over rice. And now, reader, let me recommend it to you. The festival is full of delicious food, but nothing can touch that lamb, tender and smoky and supremely flavorful. For dessert, I was served a round robin of sugary delights, eight in all. 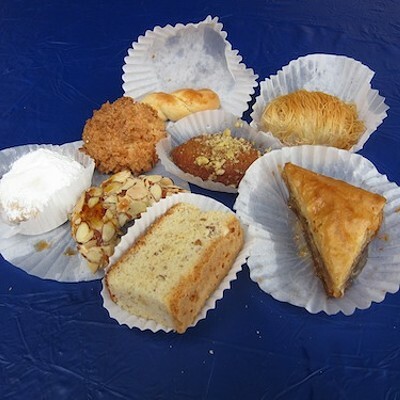 Of course, I’ve never met a pastry I didn’t like, but my particular favorites were the koulourakia (Easter cookies) and the indokarida (coconut macaroons). I should add that the women of Annunciation Church began preparing these desserts back in January. Because, yes, there’s that much demand. 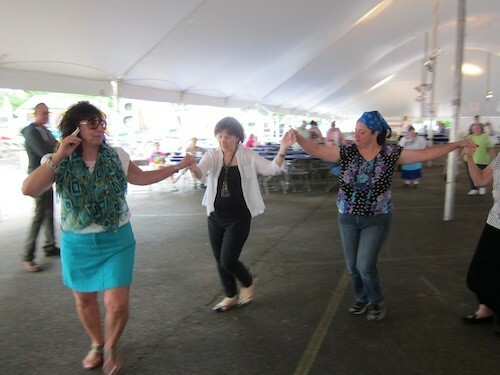 After lunch, I took a church tour and got a Greek dance lesson from Liz Ramage, who teaches the Athenian Dance Troupe. Then, after a quick spin through the Agora Marketplace, I stopped to catch my breath at the bar tent. That’s how I met Lee McBee and Troy Fink. 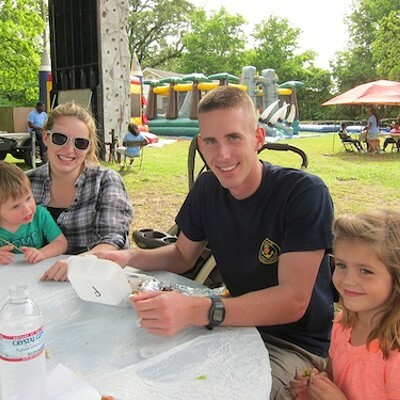 They said they had come for the late-night dancing—which was interesting, because when I spoke to them, it was still only 2:30 p.m.
Karen Lo of the Daily Meal website reports on Big Gay Mississippi Welcome Table Dinner being planned for June 13th in New York City. Headlining the event are Restaurant Iris/Second Line's Kelly English, John Currence of City Grocery and other restaurants in Oxford, and Art Smith, who owns restaurants from Chicago to Atlanta. The evening will feature several Southern chefs and celebrities who will join forces to oppose Mississippi’s recently passed Religious Freedom Restoration Act. English has waded in these waters before when he vowed to host a fundraiser for the opponent who runs against Brian Kelsey, who proposed a similar "Turn Away the Gays" bill for Tennessee back in February. Kelsey later pulled his sponsorship. The bill was later killed in committee. The first person to correctly ID the dish and where I'm eating wins his or her choice of a $50 gift certificate for Gould's or a $60 gift certificate for Pearl's Oyster House. Answer and winner to be revealed in the next contest post. The answer to last week's contest is Crazy Noodle, and the winner is ... Kim Gullett! This week, Purple Wine Company has 35 representatives in Memphis with boots on the ground getting the word out about the Four Vines label. There will be dinners meetings, visits to liquor stores, a TV appearance, and radio tie-ins. They'll also be down in Tom Lee Park at this weekend's Beale Street Music Festival to launch Four Vines' wine, food, and music program called Rock the Right Mix. "Wine, food, and music and been together for centuries, right?" says Jeff Lubin, vice president of marketing for Purple Wine Company. Four Vines will have a hospitality tent in the food court at the festival. Guests can try a one-ounce samples of the wines, which includes The Biker, Maverick, Truant, and Naked Chardonnay. The wines will also be sold by the glass at the festival. "Music is a perfect tie-in," says Lubin. 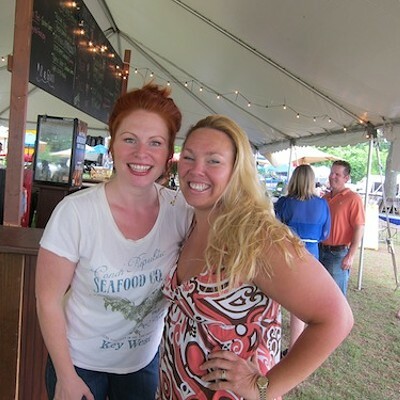 "[The Rock the Right Mix tent] is a great way to try wines in a casual atmosphere. It's about demystifying wine." Part of that demystifying is pairing a wine's "personality" with a music genre. The Biker, for instance, is an "in your face" Zinfadel, which goes well with hard rock. The Truant, another Zin, is a "rebel," and that means contemporary rock, while the Naked Chardonnay, is a wine of "inclusion," that pairs with well with pop, R&B, and reggae. The Right the Rock Mix campaign also features a microsite, fourvinesmix.com. This nifty site helps you plan a party, from the wine to the food to the music. It even sends out the invites. You pick among four themes — Summer BBQ, Mix & Mingle, Board Shorts & Blazers, Wine Tasting — and it leads you through all the steps, calculating how much food and wine you need for your number of guests, providing recipes for theme-appropriate dishes paired with a Four Vines wine, and providing a soundtrack from a playlist of about 300 to 400 songs you can play on your computer during the party.